The blogosphere has been filled with oh-so-many great ideas for celebrating Advent. Because we already have many family Advent traditions and because I've been bouncing back and forth between a sick baby and college applications, I promised myself I'd only add one new thing. 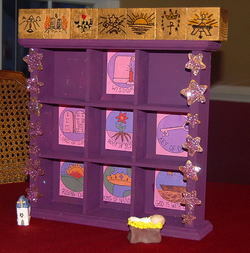 We've never "done" the O Antiphons before this year and I've always wanted to make them part of our Advent celebration, so O Antiphon Houses seemed the perfect addition. These wooden houses use cubes similar to those first described by Alice. My "house" isn't a house because I couldn't find houses during my one and only craft store trip. And my cubes are twice the size of Alice's. 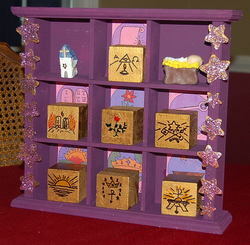 I limited myself to only the O Antiphons because there were exactly seven cubes at the craft store. Since there were nine boxes in the shadowbox, I commisioned Michael to craft a church and a manger out of Sculpey to fill the remaining boxes. Thanks to Jennifer Miller and O Night Divine, I actually know what I'm doing where the O Antiphon devotion is concerned!